There are certain events in a person’s life that call for blueberry crisp three times in a row. I’d like you to call one of those events to mind right now like right this very second, because you need this juicy sweetness in your life not once, not twice, three times over. Did you think of it yet? GET ON IT. We don’t have a ton of time here because your Hangry Dessert Self is about to show up. I’m not sure what that three-time justifying event is for me other than … this blueberry crisp. So just to repeat that, I’m celebrating the making of blueberry crisp (which, FYI, is bursting with juicy summer fruit and overloaded with an ohmygosh so good lightly cinnamony oat and pecan crumble on top that is both whole grain and refined sugar free) by making the blueberry crisp again and again and again, and eating the leftovers for breakfast. That’s rational, right? Blueberry crisp deserves more blueberry crisp. Extra topping. Drizzled with a coconut-frosting-thing. It makes one hundred percent logical sense to my foodlover brain. We have this tiny problem in our family and it’s called Food Blog Leftovers. Just let me say this: it’s really an incredible problem to have and I seriously mean that. It might be the best problem of all the problems anyone has ever called a problem. I really try not to take it for granted that we have a fridge full of mostly healthy and very fresh food on any given da- okay, just ignore that drawer on the bottom left. Eat them. I dutifully put on my uniform of sweats and a T-shirt and assume the role of Leftovers Police almost every night of the week. Freeze them for ourselves to eat later. Freeze them in a stockpile for friends who are having babies. Send them to our workplace. This was a little bit easier when we actually worked in workplaces. So naturally, we take leftovers really seriously, and it’s so so so awesome when the opportunity to share food arises because it helps us with our problem that’s not actually a problem. Enter a pan full of leftover blueberry crisp. Bjork was literally finishing his second bowl of this when I started packing it up to bring to a friends’ house and –> HOLD IT RIGHT THERE <— it was suggested to me that maybe we should actually keep this whole pan for just us. More specifically, just Bjork. My nerd-sweetie reeeeally loves a good fruit crisp. I said no, obviously, we don’t need to keep a whole pan of this sitting around our house just for us, and we brought it to our friends. Buuuuut then I made it again the next night. And again the next night. And somehow, we are able to deal with the mass amounts of blueberry crisp without any issues at all. I mean, I don’t even know where it’s going anymore. It’s, like, magically disappearing and somehow my lips and my shirt are all stained blueberry-blue. What the what. In addition to being super wonderfully delicious (maybe even more so to us since we are kind of scaling back on the shuggrr in our lives) this is a dessert that I honestly feel really good about eating in the way of putting good things into your body. Totally cool to eat for breakfast, if you ask me, because almost every single ingredient is a nutrient-packed whole food. Almond meal, oats, pecans, flaked coconut, blueberries, olive oil, cinnamon – this is truly a powerhouse drool-worthy dessert. 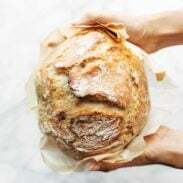 I got the starting idea for this recipe from the most amazing book I’m reading called Bread and Wine by Shauna Niequist. I literally finished the first page and thought to myself: I’m going to have to read this whole book again because I already love it so much. 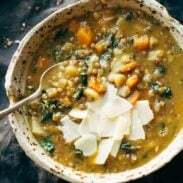 In addition to being a spiritual memoir of sorts relating food, relationships, and experiences around the table (which I heart), it has a recipe at the end of every chapter. Huzzah! This is my kinda book. Alright, I’ll leave you alone now with one last Attack of the Superlong Image to convince you once and for all that this is the most glorious summer dessert and that it’s worth making three times in a row. While you get your lips turning all blueberry-blue up in there, I’m going to be going on a super fun and wild (read: mild) adventure for a few days on a girls’ trip with friends from college since we are celebrating ten years of friendship? how and oh my wow?! The blog will keep on runnin’ and you can catch our live trip adventures on Instagram! Also, debating packing a batch of this in my suitcase. Normal, right? 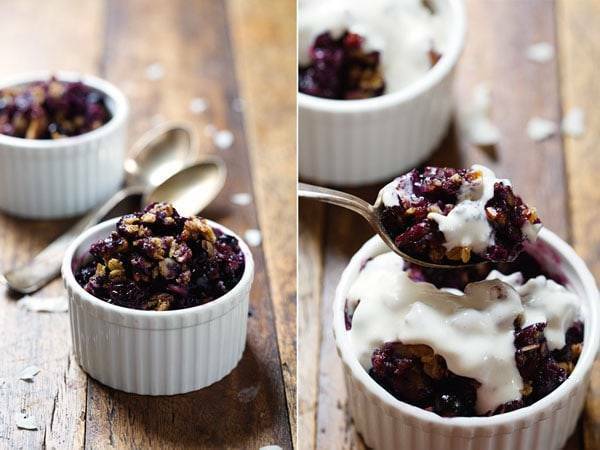 Simple Oat and Blueberry Crisp – refined sugar free and made with whole grains. Warm, juicy blueberries with a delicious crumbled topping. Preheat the oven to 350 degrees. Chop the pecans. Combine the oats, pecans, almond meal, coconut, salt, and cinnamon in a large bowl. Add the olive oil and maple syrup and stir until well mixed. GOOD LUCK NOT EATING THE WHOLE THING RIGHT HERE AND NOW. Grease a square baking dish (8×8 or 9×9) and arrange the blueberries in the bottom. Top with the oat mixture. Bake for 25-35 minutes or until the top is golden brown and has firmed up slightly. If you want, you can top with additional flaked coconut and return to the oven for another 5 minutes just for some decorative toasted coconut on top. For the little drizzle on top, I creamed 8 ounces low fat cream cheese with 1/2 cup light coconut milk, 1 teaspoon vanilla, and 2 tablespoons raw honey. That will give about 2 cups of coconut “sauce”, which is way more than you’ll need for the crisp, so you could either halve the ingredients to make less or just keep the leftovers in the fridge as a fruit dip, like I do! Num. Or just use ice cream, too! The nutrition facts here do not include the coconut cream cheese drizzle – they are just for the blueberry crisp. I believe I am going to make this tonight. I am sooooo loving your non-sugar lifestyle. Because I’m a responsible adult I’ve spent chunks of my time at work emailing myself some (or most) of your recipes. Once I’m home I’m probably going to pin all the things. Thanks for making delicious things and giving people delicious ideas. hahahah laughing out loud. Thanks Bridgett – glad you like the recipes! Whoa. This looks so good I could scream!! I love this! Yum! This looks so good. And I’m loving that coconut drizzle! I have so many problems with leftover food. This single gal can’t possibly eat everything that I make for the blog. So my neighbors, my dentist, co-workers, any anyone else I can find usually turn into happy recipients! I want to make this for dessert tonight. It looks amazing! Do you think I coulduse frozen blueberries instead? Or would that change everything? Yes, but I would sort of thaw them out and just be prepared for a really juicy mess. 🙂 There’s no cornstarch or anything to make them more sticky so it’s pretty much a messy, juicy crumble. Oh wow, what have you done. Now I’m going to have to make this on Sunday for my third-year anniversary treat and eat it all immediately because how could we not? Also love that it’s refined sugar free. I mean, that just means we can eat more of it with lesser guilt? Thanks, Lindsay. Tis the season for blueberries!!! I would not be able to wear white while eating this because I’d be slobbering it all over myself! Yum! I love this! I am sharing it with all my 10 ingredients or less boards/pages/etc! Might even have to feature it on my ten ingredients tuesday. Oohhh myyy. This looks absolutely fantastic! This looks so so good. I can’t wait to try it for breakfast…and lunch…and dinner…and dessert…and maybe a bed time snack too?!? The coconut cream cheese sauce also looks really dreamy. So glad I’m not the only one with leftover “problems”! I would have a total of zero leftovers with this crisp!! Totally agree on this being good breakfast food! Live that it’s not filled with refined stuff! Thanks Rivki! It’s definitely feel-good indulgence! HIGH FIVE for the book recommendation! I bought Bread and Wine ASAP after reading this and now looking at the author’s other books it seems like she’s going to be a fav of mine! And this shugar free blueberry dessert/breakfast/dinner=AHHMAZING. Seriously, a million high fives for you and all of your foods! I reeeally like this book so far. Lots of people have recommended all her various books to me so I have a feeling I’m going to like them! That deep purple blueberry filling… Like realllly?! So gorgeous! There is always always always a reason to have a crisp. 3 times in a row–of course. Especially when there is excellent fresh fruit available like blueberries! You know that I’ll always help you out with the leftover food “problem” any time! Did you know that there is an ad for blueberries at the bottom of the page? I thought Bjork would like to know that. 🙂 Have fun on your trip! Hm, weird, you’re still seeing other people’s info? I’ll get my team on it right away. I love everything about this blueberry crisp! So glad! Thanks for the comment Franneh! I was actually wondering the same thing but didn’t have time to test it. My gut says yes! Love hearing that Dee! I’ve even thought about making a pumpkin version… we’ll see what happens with that! Made this beauty this morning for my picky, breakfast high schooler. I slipped in some flax seed and chia and he devoured it! And it came out so pretty too! Love that! Thanks for the comment Dorcas! Do you think i could make this with apples instead of blueberries?